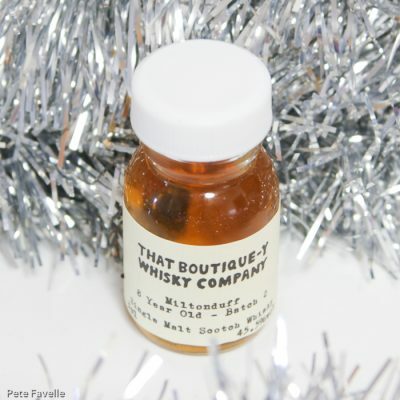 Miltonduff 8 Year Old Batch 2 is bottled at a very approachable 45.5% ABV. The nose is full of flapjacks – golden syrup and oats, with a subtle dried red fruit beneath. A gentle oak aroma starts to appear the longer it sits in the glass. Water brings out the wood more strongly, along with dry cut grass and more graininess. In the mouth it’s honey sweet with just a hint of grain, and a light wood tannin in the finish. Watered the honey is cut back and a more delicate, complex character starts to appear – barley, fresh cut wood, a little pepper and a slightly resiny finish. Perfectly tasty if a little dull straight from the bottle, a splash of water exposes a much more interesting side and pushes this up to 3.5 stars.